Every now and then I'm going to feature an item from one of our challenger's shops. Our first shop to be featured is My8KidsMom. Her dedication to this challenge has been phenomenal and she deserves to be rewarded. Visit her shop and order from her today! 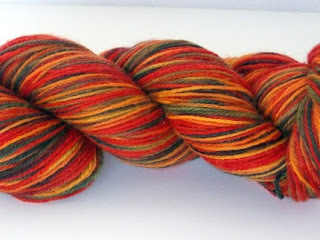 Some Fierce Tiger Handpainted Sock Yarn may be just the thing you need to keep your toes cold on cold winter nights!